management: How Has IBM Simplified the Mainframe? In October 2006 IBM announced a five-year, $100 million dollar project to simplify its mainframe. So five years on, what's changed? In the past, mainframes have been too hard to run. Mainframe administrators have needed far more technical knowledge than those on other platforms. In fact anyone working on a mainframe, from software developers and operators to security administrators, has had a harder time than their UNIX and Windows counterparts. This has been a major reason to move away from the mainframe. In October 2006 IBM announced a five year, $100 million project to simplify their flagship System z mainframe platform. So five years on, what did their $100 million buy? 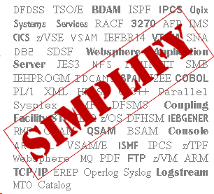 From IBM announcement letters, IBMs premier weapon in the fight for simplicity is the z/OS Management Facility. First appearing in z/OS 1.11, z/OS MF is a free software product touted by IBM as the “new face of z/OS.” Providing GUI tools accessible from a web browser, it aims to take the hard work out of z/OS systems administration. The initial release was a relatively humble affair offering easy-to-use screens to locate problem information, and send this to IBM. The z/OS Communication Server's Configuration Assistant was also rolled in. Later releases have added features to monitor capacity provisioning, deploy SMP/E packaged software, manage WLM policies, monitor z/OS performance, and manage DFSMS storage groups. As it stands, z/OS MF doesn't offer a lot that wasn't already available, though it does put them all in the same place. z/OS 1.13 has added some nice features, so it may just warming up. z/OS MF uses an OEM version of Websphere Application Server, so there will be effort to commission and maintain this extra monitor. And although it is a free product, any increased CPU usage that is not offloaded onto zAAP and zIIP processors won't be free. It obvious that the z/OS MF is a strategic tool for IBM, and more functionality is sure to come. Other core IBM products have also brought out GUI administration tools. The big success story is CICS Explorer. Introduced in CICS TS 4.1 in 2009, CICS Explorer improves on the existing CPSM Web User Interface (WUI). Based on the standard Eclipse platform, CICS Explorer is excellent for monitoring and managing large groups of CICS regions. IBM Hursley has been busy with CICS Explorer, regularly adding new features. Other tools and products such as Omegamon XE for CICS, CICS Interdependency Analyzer and CICS Deployment Assistant also hook into CICS Explorer. The idea of a GUI for managing mainframe systems is hardly new. The DB2 Control Center has managed DB2 resources on z/OS since DB2 8.1 in 2002. Since IMS 8.1 in 2002, IMS has also used the DB2 Control Center for their own IMS Control Center - a GUI for issuing IMS commands. The IMS Explorer is yet another IMS management GUI - designed for application programmers and DBAs. However it is part of the separate IMS Enterprise Suite product. Websphere MQ joined the GUI club from version 6.0 in 2007 with Websphere MQ Explorer access to Websphere MQ Queue Managers on z/OS. IBM has moved to adopt the Representational state transfer architecture (REST) to allow system management tools easy access to z/OS information. Many of IBMs new management tools make use of this new functionality. But perhaps IBMs most important GUI strategy is with its Tivoli line of monitoring products. Most of these products now use the IBM Tivoli Monitoring (ITM) framework as a common GUI front-end. A single pane of glass for all monitors is in itself a nice feature. However ITM allows information from many different monitors to be used and viewed together: a very big deal. Computer Associates also think this is a good idea, and their Mainframe 2.0 initiative heads in this direction. A few PC based tools and wizards have been appearing for z/OS administrators. The IBM Configuration Assistant for z/OS Communications Server is a Windows based tool used to generate TCP/IP policies and configuration files. Available since z/OS 1.7 it has been enhanced in later z/OS releases, and is currently included in the z/OS MF product. From z/OS 1.10, a new Windows based GUI, the Capacity Provisioning Control Center, manages and monitors the System z capacity on demand. Released with less fanfare than z/OS MF, the z/OS Health Checker is in many ways a more important step. Initially a separately downloaded product, it now comes free with z/OS. It runs as a started task that quietly and regularly checks the configuration of a z/OS system. This configuration is compared against pre-defined best practices, and alerts are raised for any potential problems. These alerts are easily viewed from SDSF, and easy-to-follow help is available on each. Users can also define their own custom checks to be run. z/OS Health Checker has quickly become a must-have tool for every z/OS system. It consumes almost no CPU, is ridiculously easy to install and use, and will undoubtedly find issues previously undetected. IBM continually adds new checks to z/OS Health Checker, including checks for potential issues when migrating to a new z/OS release. A few new ISPF features have been added. The ISPF editor can now edit z/OS USS and ASCII files, and the DSLIST application has some new commands such as FILTER and SRCHFOR. The USS shell has been enhanced to issue ISPF and TSO/E commands. New ISPF panels exist to browse the USS syslogd and RRS logstream data. SDSF has greatly enhanced its management of JES3, to the point that it is almost as good as JES2. A new System z Discovery and Auto-Configuration (zDAC) facility automates some of the tasks needed to configure new disk or tape units. From z/OS 1.12, a TSO/E user can logon to multiple z/OS systems in the same Parallel Sysplex using the same TSO/E logonid. DFSORT parameters can now be specified in sys1.parmlib ICEPRMxx members. SMP/E has been enhanced to make software and service installation easier. Before 2006, IBM was well on the way to introducing easier and more popular languages to the mainframe, particularly Java and C. In z/OS 1.9, IBM announced Metal C - a compiler to create C programs that don't need Language Environment. Now system exits and routines can be written in C. Some of these routines can also be written in System REXX - allowing REXX routines to run outside the normal TSO/E and batch environments. IMS and CICS applications can also be written in REXX. The favourite PHP is also available: IBM announced a PHP 5.1.2 port for z/OS in 2007. CICS support for PHP was announced soon after. However IBMs big software development efforts have been in other development tools. In particular, its Rational Developer for System z has become its strategic development platform. Initially announced in 2007, it builds on existing Eclipse-based Rational features to develop applications in popular languages such as COBOL, Java and C. IBM hopes to ease the pain from new application programmers struggling with legacy application development. Tivoli zSecure is excellent to simplify RACF administration and auditing. Tivoli Usage and Accounting Manager will detect software products installed, who uses them, and how often. IBM is smart to work to simplify its mainframe. As existing mainframe staff retire or move on, it needs to woo new computing graduates to the platform, and get them productive quicker. Such simplification is in many ways essential to the future survival of the mainframe. Just as importantly, mainframe workloads and systems are becoming more complicated as they increasingly communicate with other platforms and systems, and offer more features. There is no doubt that IBM has achieved a lot to simplify the mainframe, from large announcements covered here, to small useability enhancements that easily slip through the cracks. Sales figures of IBMs System z platform perhaps show that these efforts are paying off for IBM. The good news is that most staff no longer need the depth of knowledge previously essential. However, such technical knowledge will still be needed on occasion. Smart mainframe users will find and keep such a resource on hand.